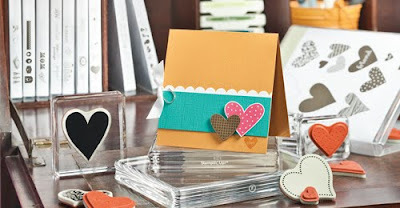 Have you heard that beginning January 5th Stampin' Up! will offer their exclusive stamp art in both traditional wood mount and the new repositionable clear mount stamps?! These will be made of the same high quality rubber that you are accustomed to with our wood mount stamps but offer the ease of use and storability of clear mount stamps. Nine different size clear blocks available individually or in a discounted bundle. Blocks have ergonomic grooves on all four sides for easy grip and traditional wood mount feel. Stamps and blocks are durable and easy to clean with your Stampin' Scrub and Mist. Tight die cutting for easy image positioning. Large clear blocks can be used to create a collage or spell words with alphabet sets. Stamps store easily in standard, DVD-type storage cases with artwork on front and spine, making organization easy. Have I got you curious? Be sure to mark your calendar for my Open House on Jan. 16th and come try them out.